One of the best things about Christmas (besides singing “All I Want for Christmas Is You” by Mariah Carey for the 17,000th time) is indulging in a dinner spread. 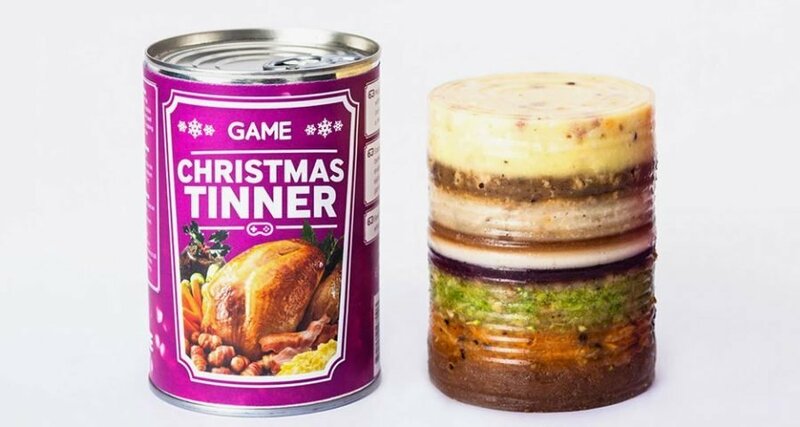 Well, dear friends, apparently, someone thought the time spent to cook such a feast would be better spent doing something else, because you can get a full-course Christmas dinner in one can. Introducing (the appropriately named) Christmas Tinner from GAME. The nine-layer meal includes everything you need for a traditional Christmas dinner, including dessert. It starts with scrambled egg and bacon (maybe it’s intended for breakfast?). Then it moves down to two mince pies, turkey and potatoes, gravy, bread sauce, cranberry sauce, Brussel sprouts with stuffing or broccoli with stuffing, roast carrots and parsnips, and, to complete the meal, Christmas pudding. It doesn’t take a rocket science to tell that this is truly a horrifying product. I think I would rather eat sushi bought from the back of a Honda Civic. But hey, A+ for creativity! While it gives back hours of cooking duty on Christmas, I think I’ll wait for the turkey to cook.